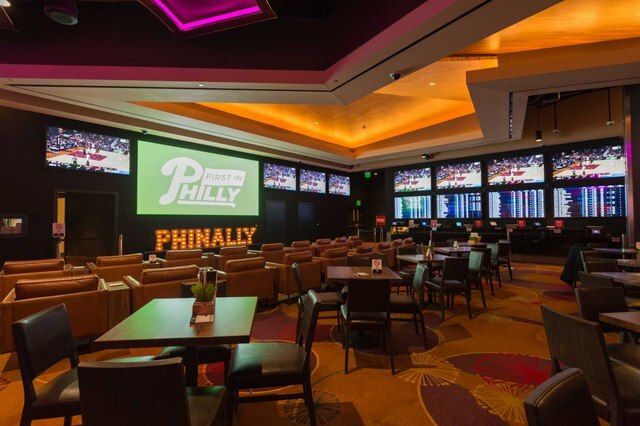 PHILADELPHIA — March 14, 2019 — For the first time in Philadelphia, the NCAA men’s basketball tournament will be available for live sports wagering at the SugarHouse Sportsbook. The casino’s “March Mania” offerings will include betting options for all 67 Division 1 games in the wildly popular bracket format, including the first four games played on March 19 and 20. Throughout the tournament, the best SugarHouse seats will be in the sportsbook and at Fishtown Hops, the casino’s beer garden. Guests can watch every game, including the April 8 championship, for free, at Fishtown Hops, or they can secure a premium spot in the sportsbook with a paid reservation. Additionally, one lucky guest will win two tickets to the semifinal and national championship games in Minneapolis, plus round-trip airfare and hotel accommodations, by placing a bet using the SugarHouse Casino QuickBet function. Sportsbook Viewing: SugarHouse Sportsbook will host March Mania seating during all tournament games, and on high-volume days, sportsbook seating is reservation-only. With a state-of-the-art 14′ x 7′ video wall and 12 additional flat-screen, high-definition monitors, guests can catch all the tournament action. Table seating reservations require a minimum $50 food and beverage spend per person (plus gratuity), and reserved club chair seating is made with a daily minimum bet; both seating options must be reserved in four-hour blocks and can be made at SugarHouseCasino.com. Fishtown Hops Viewing: Fishtown Hops is guests’ game-watching destination, with monitors showcasing all of the games. In addition to regular menu items, Fishtown Hops is offering a wide range of food and beverage specials such as $5 breakfast sandwiches, $5 nachos, $1 hot dogs, $5 chicken cheesesteaks and $3 Miller Lite beers, as well as wings for 50 cents. On Thursday, March 21, Fishtown Hops is hosting a tournament tipoff celebration featuring giveaways and more. Sports Wagering: In addition to basketball wagering, the SugarHouse Sportsbook offers a wide array of sporting events, including football, baseball, hockey, soccer and more. Bets include, but are not limited to, straight bets, parlays, totals and in-game betting. The SugarHouse Sportsbook offers six betting windows and 18 kiosks, and during March Mania, two kiosks will be moved to Fishtown Hops. For players’ convenience, the casino has created more opportunities to cash in winning bets at the cashier’s cage. Guests must be at least 21 years old to attend March Mania. No one under 21 is permitted on SugarHouse Casino’s gaming floor. The contest drawing is Monday, March 25, at 11 a.m. Complete rules and details are available at SugarHouseCasino.com.